Keeping uptodate with the latest technology in the food industry is the key to success. New belts are being offered with ultimate hygeine properties for the food processing & packaging market within the UK. Different types of belt can be used for the food industry including plastic belting or the more traditional flat belt conveyor. 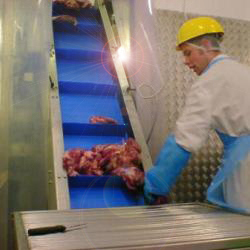 When designing conveyors for the food handling and preparation companies it is imperative that the whole systems is developed for complete hygiene and cleanliness so that food cannot be trapped and allowed to produce bacteria in your production process. Design needs to be implemented to incorporate easy clean of the conveyor belt and the construction of the framework. Stainless steel is used where possible to eliminate corrosion to a minimum and provide as hygienic conditions as humanly possible. Technology is improving all the time with the development of new types of belting and we keep ourselves up-to-date with this information implementing it into our custom build designs. Belt Conveyors are the most traditional type of conveyor and are still used for many applications.